In the past years, The Thai capital has undergone significant reforms with major mega-projects from both governmental and private sectors. 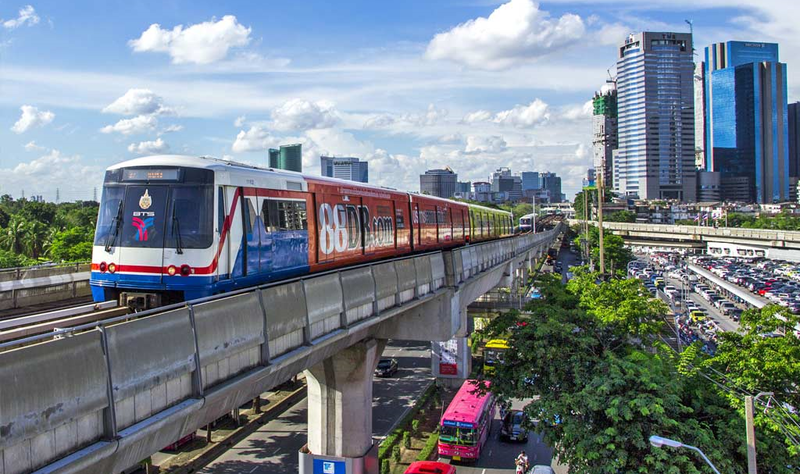 The expansion of the city’s mass transit lines indicates that Bangkok is preparing for a brighter future. The condominium market is continuously growing due to insufficiencies of land in downtown locations of Bangkok. Besides, the infrastructure improvements are a major factor that attracts foreign investors to Thailand. This rapid expansion of the city has triggered various development plans that will be constructed beyond Bangkok’s CBD areas like Asoke, Sathorn, and Silom. It is predicted that the area of Chatuchak-Mo Chit will become the new central business district area of Bangkok. According to the Nation, the condominium’s price in Bangkok’s city center is rising to Bt260,000 per square meters. For this reason, visitors and investors are shifting their investments to uptown estates which are far more affordable. The three major overseas investors are from Hong Kong, China, and Japan. Besides, the aspect of transportation and urban infrastructures developments are a crucial fuel to the outer movement of the city. With extended mass transit lines, Bangkok will be able to provide more convenient access to the outskirts of the city. The highlight of this area is ‘transportation’. The area is well-connected with various transit lines and bus services, operating trips throughout Thailand and neighboring countries. The area is connected via Mo Chit BTS Green Line and Chatuchak MRT Blue Line with close proximity to Bangkok’s famous Chatuchak Weekend Market. The Chatuchak-Mochit area is also closely located to Bang Sue, which will become the future transport hub of ASEAN with highspeed train services operating transnationally. The Sino–Thai Highspeed train is a joint venture between China and Thailand, it will be built in the Bang Sue area with provided routes from Kunming China, via Laos and Thailand, with future extension to Singapore, Malaysia, and The Philippines. The area is also expected to experience a higher population of visitors, which would increase the land value and draw more developments and investments to this part of Bangkok. SRT Dark Red Line and Light Red Line : 2 stations away from Bang Sue station on the MRT Blue Line and SRT Dark red line (Thammasat University‘s Rangsit campus to Maha Chai) and Light Red line (Salaya in Nakhon Pathom Province to Hua Mak ) via Bang Sue , linking with the MRT and the Airport Railway link. Bangkok’s largest and most popular weekend market in the heart of the city. Situated on Kamphaeng Phet road, accessible via Kamphaeng Phet MRT station. It is divided into different retail zones, ranging from fashionable clothing, shoes, home appliances, to gardening plants and pets. Central Plaza Ladprao is one of Bangkok’s most iconic shopping malls. Situated on Phahonyothin Rd, it is reachable via Phahon Yothin MRT station. The renovation and reopening of the mall have brought in new vibrant shops and restaurants for a better shopping experience. Located on Samsen-Nai road, this fresh market is popular among Thai locals and tourists. It specializes in healthy and fresh Thai vegetables, meat, seafood, and fruits products, locally produced by Thai farmers. Union Mall is a large shopping complex in the Ladprao district. Hosting 1,240 shops with a variety of in-trend fashion, accessories, restaurants, and IT products. These two complexes are entertainment and leisure centers situated in the Chatuchak and Ladprao zone. There is a range of convenient and enjoyable amenities such as the Villa Super Market, restaurants, cinema, and the night market. Wachirabenchathat Park or the State Railway Public Park (Suan Rot Fai) is a large public park located in the Chatuchak district, encompassing an area of 375 rai. The park is well-known for activities such as bicycling and picnics. The Queen Sirikit Park and Chatuchak parks are also nearby. M Jatujak is a 2 High-Rise building condominium (building A& B) located in the Jatujak area with 600m access to BTS Mo Chit. The project is developed by Major Development Public Company Limited, in collaboration with Angel Real Estate. It is Ready To Move In. The concept of this residential living is inspired by Nature and Modern Tropical architectural style, providing a peaceful and green secluded atmosphere for the relaxation of residents. Besides, the highlight of this project is the Sports Arena, which is well-equipped with a variety of sports facilities. 1-Bedroom Suite 28.16 – 30.51 sq.m. 1-Bedroom 28.50 – 35.98 sq.m. 1-Bedroom Duplex 46.57 – 57.17 sq.m. 2-Bedroom 49.83 – 65.70 sq.m. 2-Bedroom Duplex 80.52 – 80.64 sq.m. Lumpinee Park Phahon 32 is located on Phahonyothin Soi 32 with 200km distance from the Sena Nikhon intersection. It is located 600m from Ratchayothin MRT station and 2.5km away from Phahonyothin MRT station. The concept of this project is ‘Back To Nature’, exclusively providing urban yet eco-friendly facilities for residents on the metropolitan road of Phahonyothin. The project is expected to be completed by 2019. Studio 24 – 28.5 sq.m. 2 Bedrooms 36 – 46.5 sq.m. Metro Sky Prachachuen is a High-Rise Ready To Move condominium in the heart of Prachahuen-Bang Sue, future transport center, developed by Major Development in collaboration with Angel Real Estate. Under the ‘Diamond Shape Building’ concept, Metro Sky Prachachuen offers spectacular city skyline views from all perspectives. There are 1,319 units in total with room units that come in various size and designs. 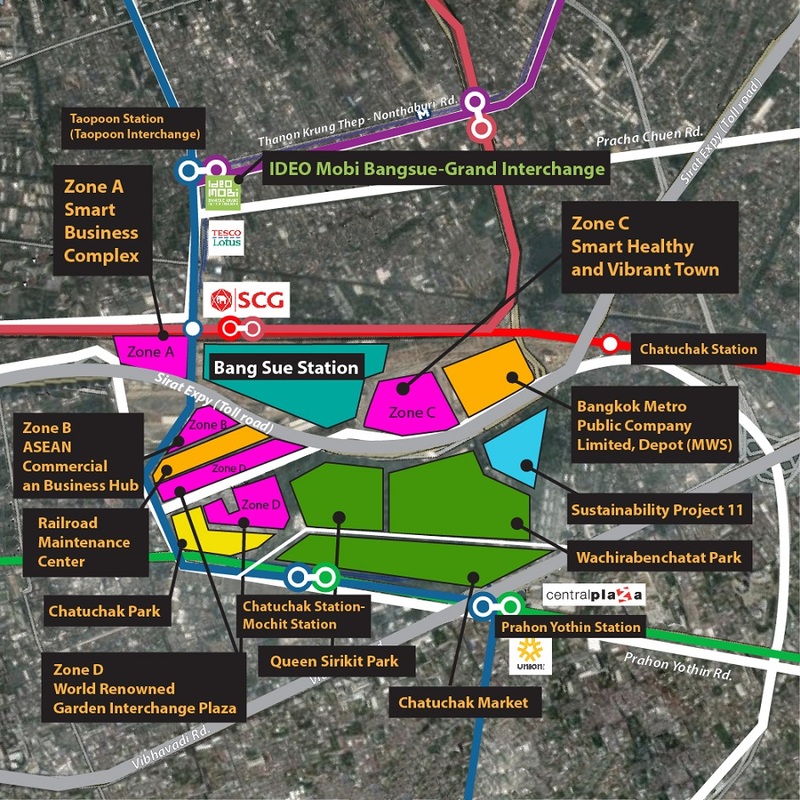 The project is closely located to the future Bang Son MRT Station (850m) and Bang Sue Central Station. 1 Bedroom 24 – 36 sq.m. 2 Bedrooms 43 – 45 sq.m. 3. Duplex (Moff) 34-47 sq.m.